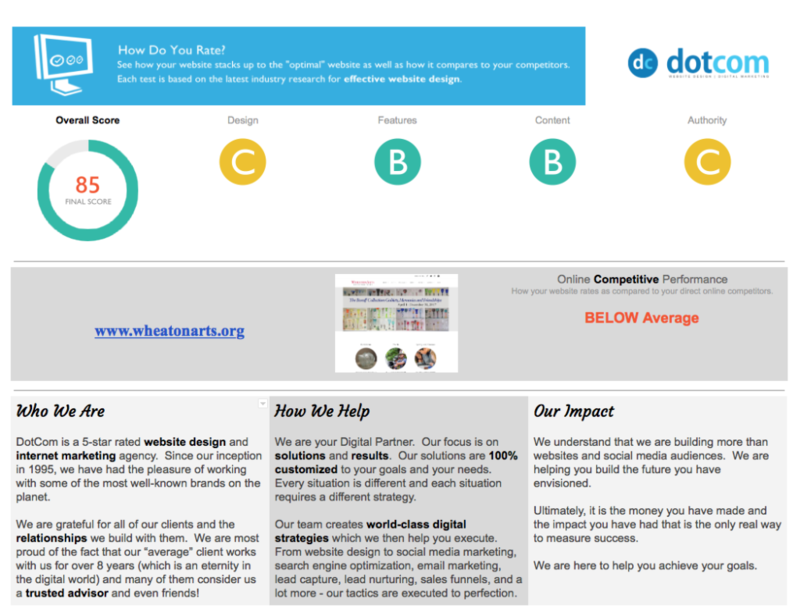 For almost a year now, DotCom Global Media has been publishing weekly reports on Cumberland County NJ website design, based on comprehensive evaluations intended to uncover the best and worst local websites in the business world. Over 350 business websites were selected for this NJ Website Design study, which included a full analysis and report of each website. Grades were assigned in the areas of design, features, content, and authority. This article provides an in-depth analysis of the websites for businesses, organizations, and associations located in Cumberland NJ. This article is intended to be a resource for business owners and website design companies looking to create a new website, or redesign a current Cumberland County NJ website design. This article provides an in-depth analysis of the websites for businesses, organizations, and associations located in Cumberland County NJ. This article is intended to be a resource for business owners and website design companies looking to create a new website, or redesign a current Cumberland County NJ website design. Brief Overview of the County from a business perspective, and the need for an excellent Cumberland County NJ website design. Simple Directory of Web Designers in Cumberland County New Jersey, or web design companies known for their Cumberland NJ website design work. This study is ongoing, and new towns are evaluated by DotCom Global Media each week. There are fourteen different towns in Cumberland County NJ and to date, we have combed through the business websites in two of these towns. 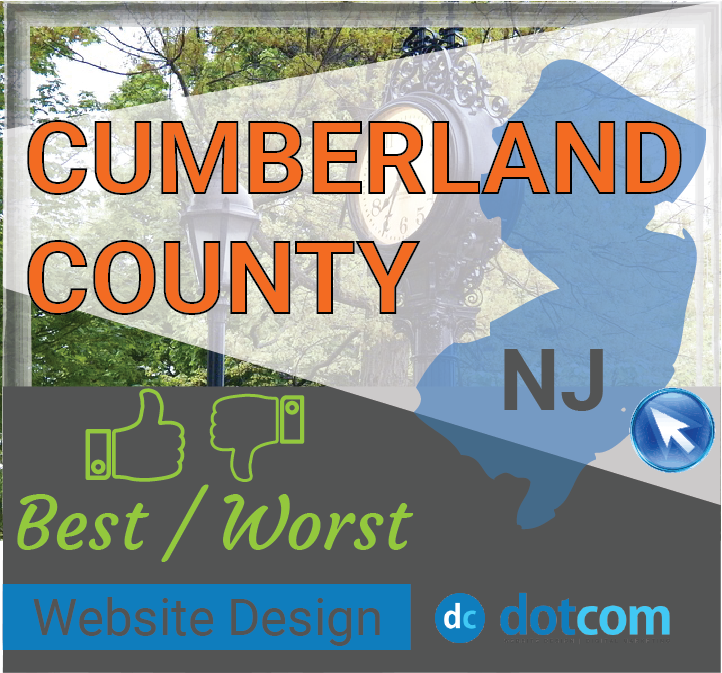 Here are the towns that were evaluated for Cumberland NJ Website Design, so far. Cumberland County NJ was twice voted one of the “best places to live in New Jersey” by Money Magazine. Cumberland County is broken up into fourteen different towns and townships, and the three largest are Millville, Vineland, and Bridgeton. The population is currently 157,000 and the median household income is nearly $50,000. According to 2015 data reports on Cumberland County NJ, the popular specialized occupations are in the following industries: Farming, Fishing, & Forestry, Fire Fighting Supervisors, and Community & Social Services. This county in southern New Jersey is centrally located, just a short distance to Philadelphia, New York, Washington D.C. and Atlantic City. Cumberland County is an economical business location with convenient access to highways and rail service, and an abundance of beautiful natural resources and picturesque scenery. Prospective business owners in this area can take advantage of Cumberland County’s business incentives like the Federal Empowerment Zone designation, Urban Enterprise Zones, and flexible financing. Read through this article carefully if your business is located in Cumberland County NJ, or if you are planning to establish a company there. Your online presence is a huge piece of your business image and identity- Even if you’re NOT paying attention to it, your website says something about your business, good or bad. 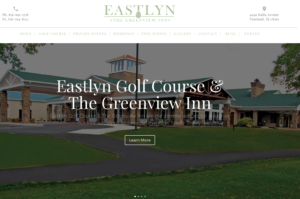 This Cumberland County NJ business has one of the most impressive websites that we’ve seen in the area, and is definitely among the best in South Jersey when it comes to design and content. This website design is very strong. It’s easy to navigate, mobile friendly, great balance of imagery and text and there are features to make it feel interactive and modern. The original photography is high quality and fast loading. There are distinct calls to action in every section. The navigation bar is overloaded and should probably be organized into two separate menus, but overall the homepage looks very clean. Even the restaurant has great photos and helpful information. The menus leave much to be desired in terms of design and format but we’ve seen much worse. The best surprise here was finding the blog. This business seems to be making good use of their content marketing strategy. We have some concerns about the length and optimization of their posts, but someone is clearly dedicated to managing this blog and posting informative content on a weekly basis. Besides providing the information about the golf course and restaurant, this website also includes a place for wedding planners and brides-to-be. There are next steps for the visitor to take, whether it’s filling out a web form or contacting a key person at the golf course to handle the reservations, private events, weddings, or something else. There is detailed information given for each room they have available for conferences and events, including dimensions and layout. All in all, this website is very well done. 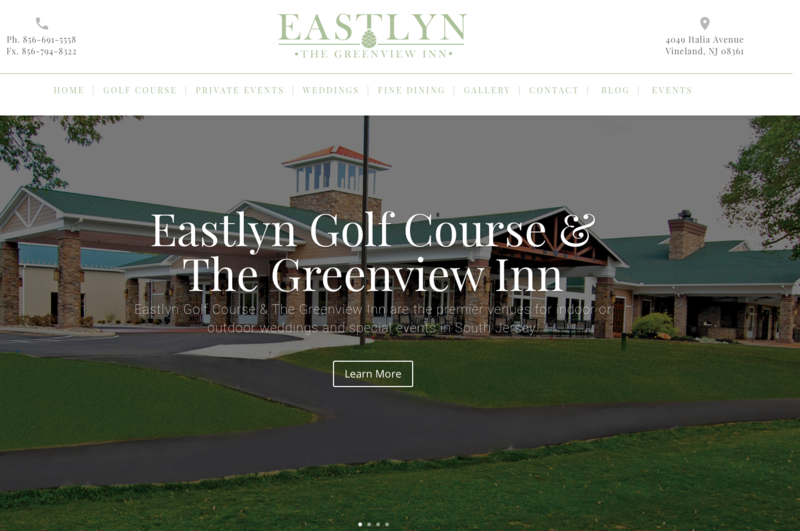 It’s easy to use, beautiful to look at, and very helpful for visitors looking to join the club, plan an event, or simply play a round of golf. Where the website could improve is the area of authority and trust score. Their ranking is not great, which impacts their ability to draw targeted traffic. Overhauling the optimization of each web page and blog post is key to improving this website’s trust. 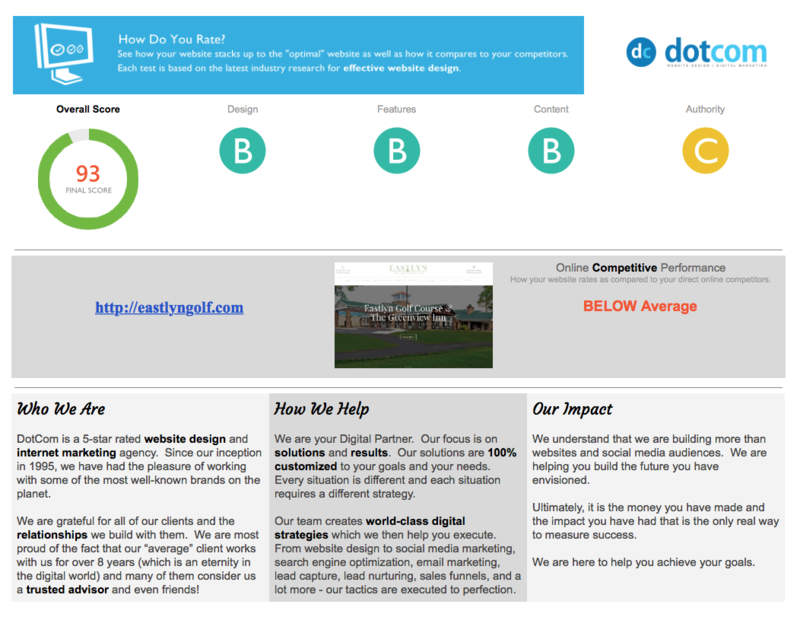 Social media integration and social proof such as awards and testimonials would be another wise step to move this website closer to earning an “A” grade. Stylistically, this website is breathtaking. We have very high standards of website design at DotCom Global Media, but this one has potential to earn the highest honor of an “A grade” – it’s just not there yet, but the photos and layout are absolutely beautiful, giving it a solid B grade in design. 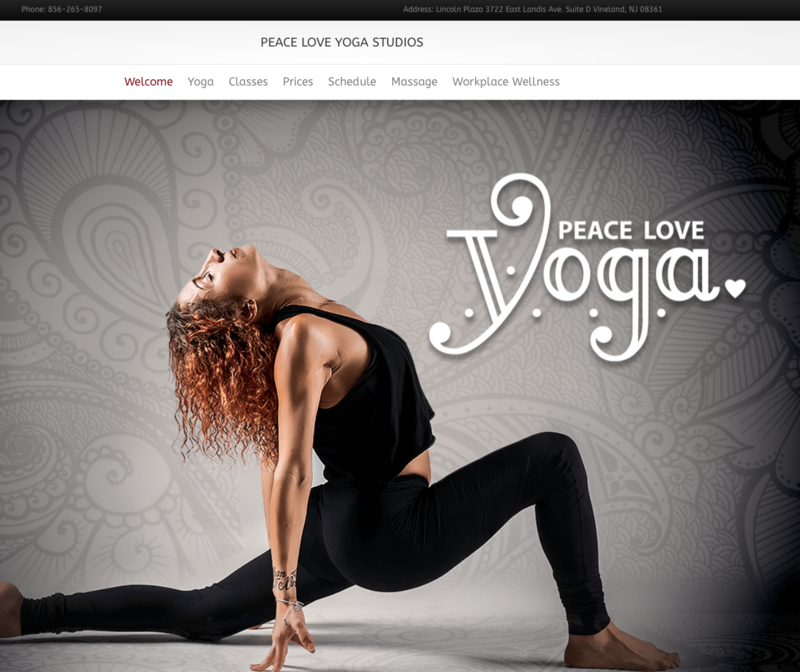 There is no question, as soon as this website loads, that it’s a yoga studio that means serious business. The photographed poses look real and they are stunning, and the subtle backgrounds details of henna designs really add to the cohesiveness of this website. There is a very interesting feature that allows visitors to take a virtual tour of the yoga studio. Client testimonials are presented in a nice way, showing photos and full names along with a brief paragraph from each person. The Meet the Team page shows photos of the two master yogis and one of them has a bio while the other is coming soon. (We hope this is true, because more often than not, it means that it’s never coming!) Another “coming soon” appears on the workshops page. Ten other names are listed as yoga instructors at this studio, showing how established this studio is, and how prepared they are to take new students. There is plenty of information about the workshops, class schedules, class descriptions, and prices. Best of all, the site maintains a very clean and minimalistic design without sacrificing content. The two areas that could be improved are content and authority. An on page content marketing strategy like a blog would be an excellent addition, but it needs to be kept updated with solid posts. Something like keyword optimized content is a great step toward getting targeted traffic onto the website and ranking higher in search engines. The authority portion has a lot to do with content and links also, and it’s worth the investment to get a better trust sore. Wheaton Village, now called Wheaton Arts and Cultural Center, is the home of the nation’s first glass industry. The Museum of American Glass and the glass blowing factory are still fully operational, and there are workshops and tours scheduled year round. Considering how amazing this WheatonArts is, we were thrilled to find out that the website was equally informative and compelling. 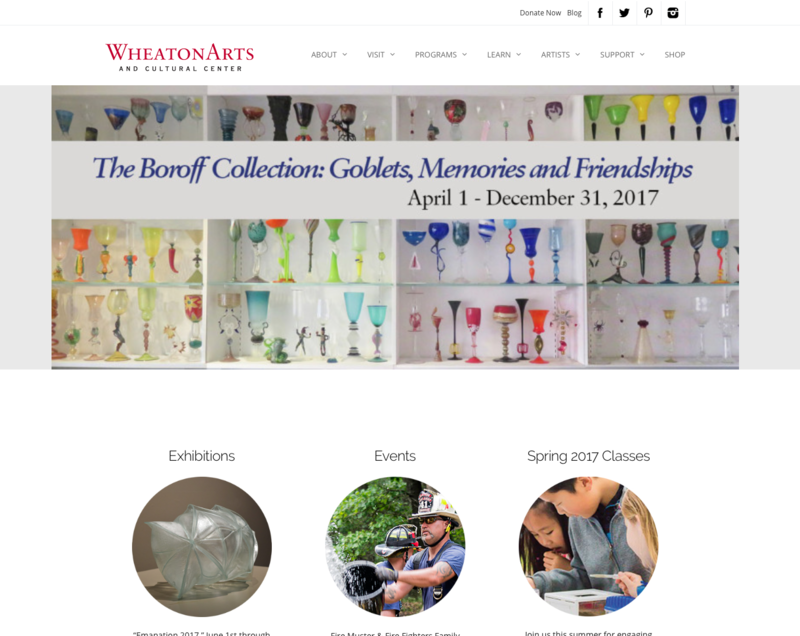 In terms of content and design, this website dances circles around several of the local college websites, which is both a compliment for WheatonArts and a warning for local colleges. The WheatonArts homepage is interesting and it pulls you right in with a banner for the Festival of Creative Art. The nav bar has six options that drop down into a ton of other items, but everything is organized well. There are photos of featured art exhibit, a list of upcoming events and ongoing classes, and two calls to action: shop online and plan a visit. Press releases are published on the Newsroom page. 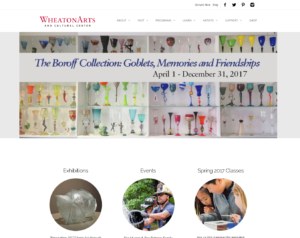 There are resources for educators, and various links to different staff and departments within Wheaton Arts. The online shop has a variety of products from pottery and handmade jewelry to glass blown housewares and home décor. A community of artists work at the WheatonArts studios and their works are featured and sold through this website. There are a bunch of cool things listed under the Programs tab in the navigation bar, including a nature trail and Folklife cultural studies. There doesn’t seem to be an active content marketing strategy in place, such as a blog on this website, but someone is taking time to keep things updated. 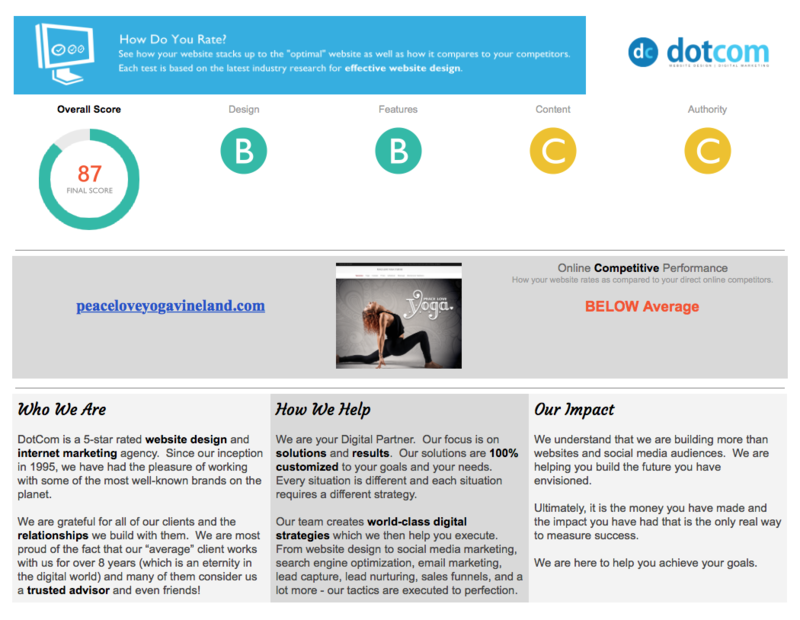 One area this website could improve greatly is their authority and trust score. We believe if this website was properly optimized for search engines and keywords were used in the right places and the right density on these pages, this site would rank much higher in Google. The branding part of design could also be improved, to get away from the generic styling and make more of a recognizable statement, starting with the logo and establishing a style guide. Still, the WheatonArts website is one of the best ones that we found in Cumberland County NJ. There are a lot of websites that kind of fall in the middle. They’re not good, but they could be worse. Most of these “high potential” website design examples are placed in this category because they scored low on our evaluation, but the businesses themselves are so great that we see a huge opportunity for success. Here are the local websites we found that don’t stand on their own yet, but could be absolutely killer if they made the right moves. This website design is modern and effective. Functionality is great, good balance of visual elements and text, and it’s easy to navigate. This site follows the right layout with two navigation bars organized at the top, and a call to action button on every page. Great media gives this website a higher grade, too. They have high quality photos (albeit stock photos) and an good introductory video about the business. The Resources page is very thoughtful and it’s often an overlooked asset, especially for this type of business. Providing links to grief counseling services and local businesses like florists is a great way to serve visitors on this website. Design and layout are great. The images are vibrant and inviting. The only complaint about these images in the lack of people- it doesn’t make a human connection. Messaging is a problem on this website. It’s confusing as it’s attempting to serve two separate businesses: a farm and a packaging process. This makes it hard to figure out exactly who their customer would be. It’s not good for the user experience. The best feature on this site is the recipes page! They look delicious and it’s a great feature, but needs to offer a print-friendly version. The Our Family page should be revamped. It’s a collage of photos with no captions or explanations. The written content on this page is literally one tiny paragraph. It doesn’t tell us enough and the photos seem completely purposeless. This website design is basic but it gets the job done. Right from the homepage, you can see what movies are playing and when. There doesn’t seem to be a way to order tickets online which is an obvious step if they want to increase sales and improve the user experience. There is no shortage of written content on this site, but it’s hard to comb through. There needs to be a topical index, especially on the rules and FAQ pages. Right now, it’s just a long scrolling page of unorganized text. It’s a mobile friendly site, and there is a mobile ordering option for food and drinks on site. Unfortunately, the mobile site is hosted on another platform. It’s not as good as having this feature hosted on the Dealsea Drive-In Theatre website. Where are the photos of the actual venue? Where are the happy people sitting in cars while a movie plays? A professional photographer would make a world of difference here. There should be at least one great shot on the top of the homepage, before getting to the movie artwork. Website authority is the first thing we’ll address here. Bogart’s almost landed at the bottom of the WORST list, because when we followed the Yelp link it took as to an old site that was absolutely horrible. After poking around on Google awhile longer, we stumbled onto this new website which has a different domain name. This new site is still lacking in many areas, but is leaps and bounds better than the old one at http://www.bogartsbookstore.com. There are some great photos of the interior of this business, including the one at the top of the homepage. This bookstore seems to be a hub for the community to enjoy live music and events, including potlucks and painting projects. There is a photo gallery full of images and it would be nice to see more of them incorporated throughout the site. The events calendar is the only useful feature on this website. The events are clickable additional details. Oddly enough for a bookstore and care, there is very little information about either on this website. This is a hugely missed opportunity. They should have a page devoted to the books they actually sell, and at least show a café menu! A blog would be a helpful tool here also, to feature stories, reading groups, drinks and snacks during different seasons, etc. Their website authority would improve if they posted regularly and keyword optimized their posts. This website design is very outdated and desperately need an upgrade. It’s not responsive or mobile friendly and has a terrible trust score within search engines. Imagery is very mediocre. Big, professional photos of kids doing different activities would help to make a connection with the visitor. All documents should be digital. Where are the web forms? Where are the edit-on-screen applications? It’s not convenient to download, print, fill out and fax. This is a very archaic way to collect data from a website. The primary images on this site are terrible quality. Really in dire need of a professional photographer to take original shots of the theatre, performers, and a group shot of a captivated audience. There are distinct calls to action on each page. It helps to guide the visitor through the site. The content is updated and there is a decent amount of info about each show. Branding is an issue here. There is nothing cohesive about the website and it’s not a memorable design at all. The colors do not work well together and there are too many different fonts and styles going on. Awesome photos of the shop, the staff, and tattoo art. There is also a video. Functionality-wise, it’s not bad. The website is fast loading and responsive. There aren’t any features worth mentioning, however. The website design itself is nothing special at all, and it’s overall very dark. Too dark, with the black background. A gothic website design can be achieved with a better approach to keep things vibrant and modern. It’s very light on the content side. The pages need more written content. There are too many items in the navigation bar. Five is the perfect number, and sometimes we can get away with six, but it’s better to separate into two menus or take another approach when the menu starts getting too long. The best features on this website are the video tour (though the quality is really low) and the integrated calendars of events and sports. Content is not bad, from a quantity standpoint. However, there doesn’t seem to be any content marketing strategy in use. The only thing that seems to get updated are the calendars. This homepage is upside down, in a sense. The most interesting nad compelling info is at the bottom, and the stuff at the top does nothing to draw you in. There should be a full width hero image and clear messaging right at the top- above the fold. By far the most impressive feature is the complete plant directory, which is a database of every type of plant and flower along with an image. Account holders can login to view the complete inventory and pricing in real time. The photos on this website are vibrant and not bad in terms of quality. Some are better than others, but we would like to see more of a human connection made in the imagery. Despite the heavy amount of written content, the pages are no keyword optimized which impacts the search engine ranking and trust score. There is lots of room for improvement if they want to attract targeted visitors. Some of the photos of animals on this website are really cool. What they’re missing, however, are photos of the zoo itself and the people interacting with the animals there. The features on this website are not executed well. For example, the donations page directs visitors offsite to a generic PayPal landing page. This feature should be on site, and it’s easy to integrate the PayPal shopping cart without redirecting offsite. Several pages are incomplete in appearance. The Adopt An Animal feature is a great idea, but the page has nothing compelling and there are no webforms or next steps. Events are not current- The three events listed are from last year. There are lots of outbound links – that’s a good thing for the website domain authority. Choosing the worst websites in a town like this is painful. 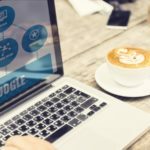 As a web designer in the Cumberland County area, I’ve seen these types of mistakes over and over that are wreaking havoc on these businesses and killing their SERP ranking. Some of these websites are so terrible that I’m assuming they came free and ready-made with a domain purchase. The mistakes are numerous and easy to avoid if you’re a web designer who know’s what you’re doing. This website seems to be under construction, but we’re grading the current design for purposes of the Cumberland County NJ website design study. There is only one link in the navigation bar, which opens a .pdf of the menu. The logo is absorbed by the tie-dye background on the homepage. There is nothing solid in terms of branding. All fonts, colors, and affects seem to be randomly selected and they don’t go well together in any case. The only page to the website is the homepage, which is mostly just an image with text, followed by a ton of crappy looking links and products (bumper stickers). The placement and presentation is very poor. Social proof is the strongest element on this website and it’s poorly presented all the way at the bottom. The images are linked to press and reviews, but the graphics themselves are terrible- no consistency in size or format. We hope the new website design will be ready to launch soon, and it should address all of these issues if the web designers know what they are doing. The template itself is not bad- there are 5 items in the nav bar, the site is mobile friendly, and the colors and font are good enough for a typical business; but the webpages are not filled in enough. There’s barely anything to this site. For starters, the imagery is not acceptable for a 2017 website, as it claims in the footer. The big image across the top of the homepage is a college of tiny photos that are too small and low quality to care about. Written content is a major problem. There isn’t enough text at all. To make matters worse, there are grammatical errors, fragments, and mistakes throughout the little bit of information that there is on the website. The beers are listed by name and with short descriptions; but unfortunately, there are no images or supporting content to really “sell it,” and each beer is listed like a blog entry. This website does not look professional or even thoughtful. It looks like a five-minute job. The website design here is really poor. It doesn’t reflect the apparent vibe that this restaurant touts, based on the photos and history. It’s archaic, non-responsive, and mostly wasted space covered with dark green wallpaper. The photos of the interior are not too bad, but what’s missing is the PEOPLE and the FOOD! All good restaurant website have large, high quality photos of happy customers eating delicious food at their restaurant. Written content is really lacking on this site. No menu. No ordering options. Nothing. The only thing this website has going for it is the fact that it’s mobile friendly. Otherwise, it’s a poor excuse for a business website. The photos aren’t terrible but they may as well be stock. There’s nothing showing the restaurant, customers, or anything special. Navigation bar is limited to Home, Menu, and Contact Us. There are only three pages, and none of them are well done. There is hardly any written content. The authority for this site is virtually zero. No optimization, no keywords, nothing for Google and Bing to crawl and record. There is nothing to this website. This site is built on a generic template. It’s completely obvious. The photos aren’t bad but they’re not presented well. They are also pixelated due to low resolution. Content is too light and there are only three pages. Not much information about products or services or policies. This website was probably set up years ago and never touched again. There’s nothing useful on there- not even store hours. This is a horrible website. It’s an ugly design, and it’s missing even the most basic elements. There is no phone number or email address, no operating hours, and no directions. The photos of the food are the absolute worst. Stock photos would have been a much better choice, but the ideal scenario is to have a professional photographer take original, high quality photos. It’s terrible to read through this website. Typos are everywhere, including in the top-level navigation bar. A content writer would do a much, much better job with writing text for these web pages. Surprisingly, the template used for this website is mobile friendly. That’s the only positive thing about this site. It needs to be completely revamped. This is the most archaic website design around: the small box with rounded corners that contains the entire website, smack in the middle of the screen. It’s not attractive, it’s not mobile friendly, and it wastes valuable space. The photos are too small to make an impact. The good thing is that customers are shown, rather than stock photography or inanimate objects; but the quality and dimensions are very poor. Again with the photos, the two photo galleries are a disaster. The photos are terrible quality, very small, and you can’t click to enlarge them. Below is a profile of each website designer in Cumberland County New Jersey (physical address is listed as Cumberland County NJ) or web company who is known for their Cumberland County NJ website design work. http://www.townsquaremedia.com Townsquare Media is well positioned thanks to their affiliation with the local radio industry. While the name is familiar with businesses in South Jersey, Townsquare Media is more infamous than famous. Their website designs are stock layouts and the SEO and digital marketing services they offer seem to lack a customized strategic approach. We have only heard bad things about this web design/marketing company. 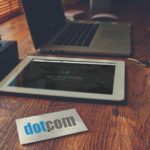 You could get the same quality for much less money with those starter packages that come cheap with a domain name purchase. While there is no shortage of business activity in Cumberland County NJ, companies actively operating in this town are lacking in the area of effective web presence. This is a missed opportunity both for businesses and for potential customers. Most Cumberland County NJ websites are poorly designed, and worse- they’re virtually impossible to find through online search. To up your chances for success, get your Cumberland County NJ website design set up the right way on the right platform, with an approach that draws targeted traffic. 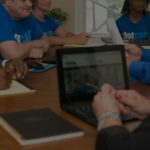 A beautiful website that’s supported with smart tools and a digital marketing strategy will drastically help your local NJ-based business to thrive. Rhapsody is a well researched writer who specializes in creative marketing projects. Read her truthful account "Handling Business: From Dream Jobs to Family Life and Entrepreneurship." Get in touch with Rhapsody Hahn-Chaney.